Everything’s bigger in Texas, including solar energy! According to the Solar Energy Industries Association (SEIA), the state of Texas is on track to become the fastest-growing utility-scale solar market within the next five years. Based on recent reports, Texas has installed enough solar energy to power 61,000 homes and has earned a spot on the top 10 list for nationwide installed solar capacity. And over the next five years, the Lone Star State is projected to install enough solar electricity to become the second largest, right behind California. This all sounds well and good, but what does this mean for home solar users in Texas? And what does utility-scale solar even mean? Let’s dive into these details below. What Is Utility-Scale Solar? This is a term used to describe a type of solar power facility. The exact size of this type of a “utility-scale” facility is not currently defined, with some output capacities ranging from 25 kilowatts to more than 50 megawatts. But it is agreed that a utility-scale solar facility is one that generates solar power and feeds it into the grid, supplying a utility with energy (hence the term). These solar power plants are selling energy to the grid, similar to how home users with solar panels can sell excess power back to the grid through net metering. Utility-scale solar plants provide the benefit of fixed-priced electricity during peak demand periods when electricity from fossil fuels is the most expensive. The production of solar energy on this level helps to reduce fossil fuel consumption while meeting growing energy needs. “This strong demand for solar energy is generating thousands of well-paying jobs for Texans, hundreds of millions of dollars in economic benefits, and providing customers with another option for meeting their electricity needs. 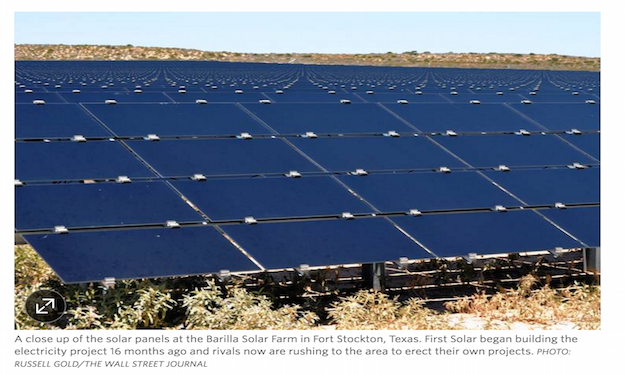 And the best part – this solar boom is just beginning,” said Tom Kimbis, SEIA’s interim president. Texas Solar Incentives. Although we believe that any production of solar energy is a step in the right direction, there are advantages to generating your own power at home. Individuals with home solar panels can become more self-sufficient and take up far less space than utility-scale facilities. If you live in Texas and are ready to take advantage of the benefits of home solar power, you first step is to take a look at specific Texas solar rebates and incentives. Texas offers a “property tax exemption that allows residents to take an exemption from taxation of the amount of the appraised value of the property that arises from the installation or construction of a solar or wind-powered energy device that is primarily for the production and distribution of thermal, mechanical, or electrical energy for on-site use, or devices used to store that energy. In addition, there are a total of 153 solar incentives programs available throughout Texas, depending on your region and utility company. Easily find out exactly how much you can save with solar panels with our solar savings calculator. There's never been a better time to go solar with residential panels. You can also speak directly with trusted Texas solar installers by filling out the short form below. Learn more about Texas solar rebates and solar power systems by speaking with an expert today.